I must admit, I have a HUGE jewelry collection. I love having fun pieces to mix and match with every outfit. I have lots of brightly colored pieces that I can pair to create fun looks. But none of those are my favorites. My favorite pieces are those that hold special meaning to me. The gifts from my children. The pieces that are personalized. Aside from my wedding band, my favorite necklace is easily the simple pendant with my children's names engraved. I love wearing their names close to my heart. It might not be the blingiest or the biggest statement piece, but it means the world to me. Is it any wonder that simple pieces like this are SUCH a Mother' s Day staple!? Today, I'm super excited to share a new deal from Stella & Dot. Now through May 14th, all engravables are 20% off! Like I said, I have a LOT of jewelry. Nearly half of that is Stella & Dot. I love their stunning variety of trendy and classic pieces that are made to last. I have had pieces for years that still look great and are still super stylish too. 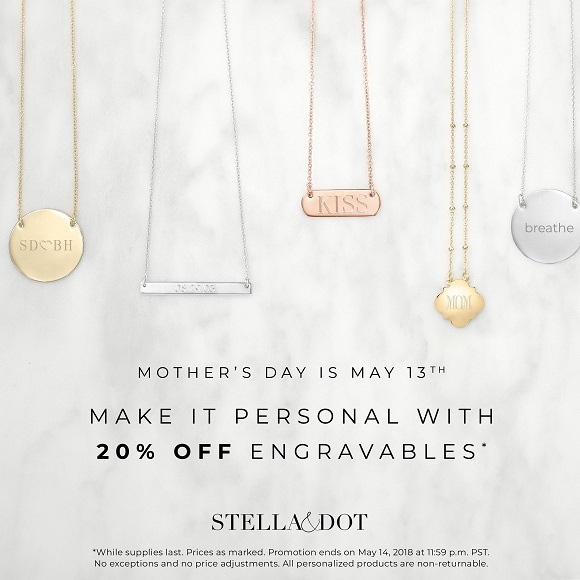 These engravables offer those same great styles and quality that we've come to expect from Stella & Dot... but allow for the customization to get the perfect piece for the mother on YOUR list! Mother's Day will be here in just over a week! Hurry over to take advantage of the 20% Off Engravables at Stella & Dot today! Take a look around Stella & Dot. What are your favorite pieces? Love it all? Sign-up to be a Stella & Dot Stylist Today! Their jewelry is really pretty. Be a nice Mother's Day gift! The selection is really nice. ITs a unique idea.